- Silverfish are a unique little critter, shaped with a slender, long silver body that grows to about three-quarters of an inch long. They have antennae, and can be seen wriggling around areas where moisture is near (bathrooms, sinks, bathtubs, basements). 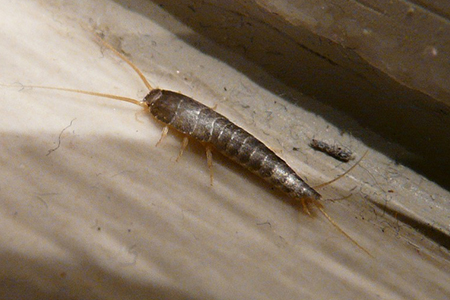 - Silverfish are very common here in Florida, as they take up homes feeding on crumbs, wallpaper glues, bugs, and other substances that can provide them with starch content. - The silverfish itself is a harmless pest, but they can be a nuisance when seen running through a clean bathroom or when going through storage and shuffling through boxes. They can be found year-round in most areas, staying relatively dormant in the daytime and remaining most active in the dark hours of the night. - Fear not, as Silverfish can be controlled and eliminated with the help of the knowledge and expertise an Advantage pest control professional can provide you with. © 2016 FICMS. All Rights Reserved. Copyright © 2018 Advantage Pest Related Services, All rights reserved.